of the movies. 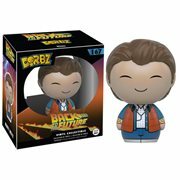 Let us be your one-stop shop for the most essential Back to the Future collectibles, and celebrate like it’s 2015! We at Entertainment Earth have custom curated this product selection for you, and it's out of this world. 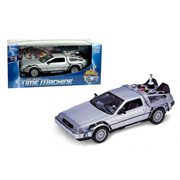 Crank up the flux capacitor and order yours while there's still time! 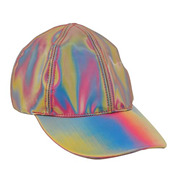 Gadzooks, it's back to the future with Marty and Doc! Our heroes and that fantastic time machine are featured in this fabulous array of T-shirts, vehicles, and more right out of the movies. 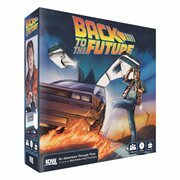 Let us be your one-stop shop for the most essential Back to the Future collectibles, and celebrate like it’s 2015! We at Entertainment Earth have custom curated this product selection for you, and it's out of this world. 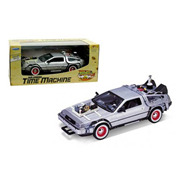 Crank up the flux capacitor and order yours while there's still time! Back to the Future is a 1985 sci-fi comedy film directed by Robert Zemeckis and produced by Steven Spielberg. Zemeckis wrote the story, along with Bob Gale. It stars Michael J. Fox as teenager Marty McFly and Christopher Lloyd as mad scientist Doctor Emmett L. Brown. 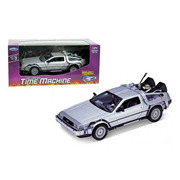 Sent 30 years back in time in a DeLorean time machine, Marty inadvertently interferes with his parents' courtship and is forced to try to make them fall in love... or he will never be born. Following the success of the film, two sequels were filmed together: Back to the Future Part II and Back to the Future Part III. This article uses material from the Wikipedia article "Back To The Future" and is licensed under the GNU Free Documentation License.